According to reports, two top officials have been executed by Kim Jong - Un. This is coming just five days after the mishaps at North Korea’s test missile site.One of the men executed was killed after he allegedly took responsibility for issues that arose at the Punggye-ri nuclear base, which led to the date of a rocket launch being pushed back. Five days ago, a high-ranking official once described as the ‘second most powerful man in North Korea’ disappeared from public life, sparking speculation he too may have been executed by death squads. The first man executed General Hwang Pyong- was once the most senior military officer in the hermit state as a Vice-Marshall after the supreme leader. The most recent victim was said to be the director of Bureau 131, in charge of construction at Kim’s missile and nuclear bases. Back in September, at least 200 workers were reportedly killed when a tunnel collapsed shortly after the detonation of an H-bomb. 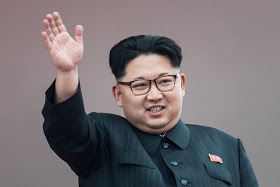 It has been claimed the nuclear base, situated in the North Korean mountains, is falling into disrepair after being struck by earthquakes and landslides due to repeated nuke blasts. Kim has executed more than 340 people since he came to power – and that doesn’t include untold numbers sent to gulags or labour camps.